In this round of awards, two Starting Grants of the European Research Council (ERC) go to professors at the Institute of Science and Technology Austria (IST Austria). One of the awardees is Mikhail Lemeshko, a theoretical physicist who has been working at IST Austria since 2014. In his project, which the ERC will support with about 1.5 million Euro, he will establish a general theory of a quasiparticle, the angulon, that he discovered during his time at IST Austria. The angulon quasiparticle is expected to help tackle previously unsolvable problems in various fields, ranging from physical chemistry to the technology of data storage. Rotation is ubiquitous in nature, from the motions of electrons in an atom to the formation of galaxies. In the microscopic world governed by the laws of quantum mechanics, the interactions between rotating particles are extremely difficult to model. This was the problem Mikhail Lemeshko aimed to tackle when he introduced the angulon quasiparticle three years ago. The Quasiparticle is a physics concept that can help to significantly simplify the description of many-particle systems and thereby make previously unfeasible calculations possible. For example, to describe the rotation of a complex molecule in a liquid, physicists in principle have to model the interactions of trillions of particles interacting with each other. This would be time-consuming if not impossible. Alternatively, they can try to split the problem into building blocks that interact with one another only weakly. The angulon is such a building block, consisting of a rotating molecule and the surrounding liquid carrying angular momentum. It already allowed Lemeshko to explain 20 years worth of experimental data, which provided strong evidence that angulons are indeed formed in experiments. An approach to make memory fasterIn his ERC-funded project Lemeshko aims to develop a general theory of angulons, and apply it to a variety of unsolved problems across physics and chemistry. One example is the challenge to speed up the memory used in smartphones and computers. Memory devices consist of magnetic moments — spins — that are either pointing up or down. In order to write to the memory, the orientation of spins is changed by applying a magnetic field, but this process is slow. Research on faster technology has been going on for years, but has not led to products that can be used in electronic devices yet, as too many phenomena remain not understood. Some of these puzzles are related to rotation, or angular momentum, which is where the angulon might be able to help. Using the angulon to explain these phenomena will move researchers another step forward in the process of understanding magnetic processes and may allow them to develop faster memory technologies. Another application for the angulon comes from chemistry. The way molecules react with each other is determined by their relative orientation in a solvent, which of course changes with their rotation. Also in this case, the angulon might allow for calculations and predictions that seemed impossible before, with the ultimate goal of being able to control chemical reactions at some point in the future. “There are lots of problems that seem unsolvable if approached in a brute-force fashion, however, introducing quasiparticles makes them tractable,” says Mikhail Lemeshko. 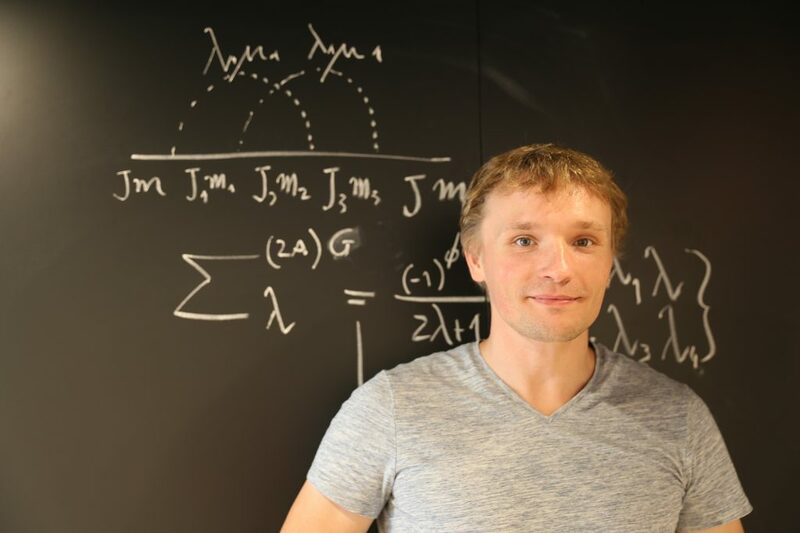 Mikhail Lemeshko joined IST Austria four years ago after having spent three years as an independent postdoctoral fellow at Harvard University. Last year, he was awarded the Ludwig Boltzmann Prize of the Austrian Physical Society. His research group focuses on the physics of quantum impurities possessing orbital angular momentum. Currently the group includes two postdocs and three PhD students, and is expected to grow substantially with the new ERC funding available.